From a Colts press release: The Colts is pleased to announce the appointment of Jeff Queen as the corps' percussion arranger for the 2007 season. "Jeff brings a wealth of knowledge and experience to our veteran design team, and we are excited to have him with us," said Colts executive director Greg Orwoll. "I am very impressed with his credentials and track record of success, certainly, but I am as impressed with Jeff personally. He will be a huge addition for our program." 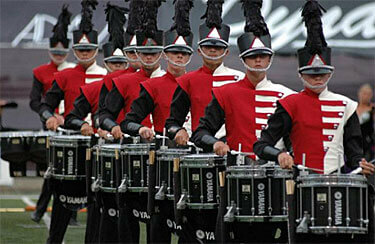 The Colts snare line at the 2006 DCI World Championships in Madison, Wis.
Queen has been involved in percussion since the age of 10. At 15, he began his drum corps career with the Bluecoats and later marched as part of Velvet Knights, Santa Clara Vanguard, Blue Knights and the University of North Texas. Queen previously served as a caption head with Carolina Crown and was a cast member of the Tony and Emmy award winning show "Blast." Read more on www.colts.org.